Don Smith (California, United States) on 11 August 2010 in Landscape & Rural. If you read the narrative from my previous post you may recall that I discussed using our imagination even at the iconic locations. 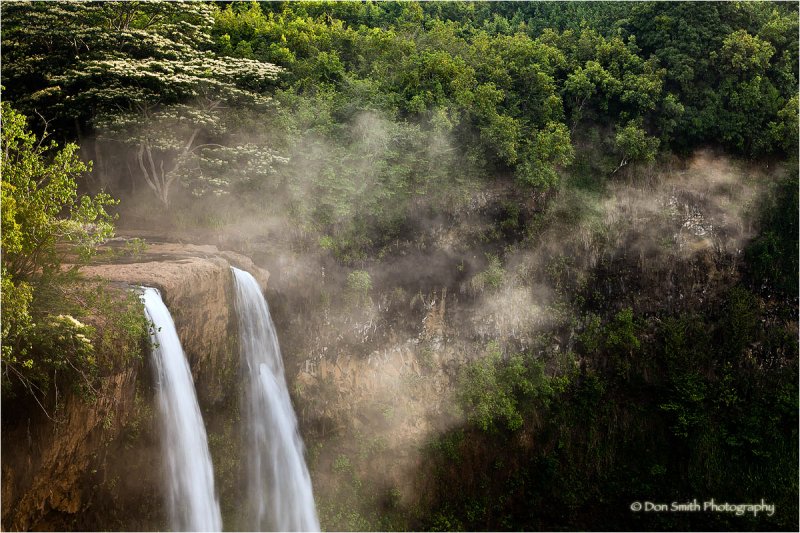 In Kauai, it doesn't get much more iconic than the lookout area for Wailua Falls. If you are old enough, you may be experiencing a deja' vu moment right about now. If you remember the popular American television series Fantasy Island (starring Ricardo Montalban as Mr. Roarke and Herve' Villechaize as Tatto - Boss, ze plane, ze plane) then you will no doubt recognize these falls as part of the opening sequence of island (Kauai) scenes. Having personally photographed these falls many times over the past 10 years, I challenged myself (and my students) to try for differing compositions. My group was the only ones at the lookout area (arriving shortly after sunrise) and we were treated to rising mist as the sun began to warm the water. I have written many times in the past that perhaps my most successful waterfall images include only a portion of the actual falls (the viewer's imagination fills in the rest). So how do I (or anyone else in the workshop) make a unique image of this iconic location? Personally I start by first observing. I challenge all of you to do the same. Don't immediately arrive upon a scene and start photographing without really having a plan. I start by making a mental checklist (which I verbally recited to the group) of what is important about the scene I am viewing. The falls were obvious, but what about the mist? What about the lush foliage? What about the interesting mountain behind this scene (not included in this frame)? What about the interesting cloud floating over the top of the mountain? (also not included in this frame)? Where is the light coming from? (backlit). Do I need a GND filter to control contrast (in this frame I did not). What mood will the light evoke? Are there any potential problems that could work against us in creating this image? (flare, wind, mist blowing on our lenses, hot spots that will draw the eye out of the scene)? How can I best control those problems? What lens will work best for the scene? (I used a 24-70 mm). Should I use a polarizer, and if I do, have I remembered to turn it? Are my filters clean? Does this scene work better as a horizontal or vertical (I challenge you to shoot both), how should I frame this scene? What do I want the viewers to see? What aperture is required to produce my desired depth-of-field? Will my shutter speed be an issue? Do I include a foreground? Can I photograph this scene from a different vantage point (unfortunately we could not though there is a steep trail to the bottom of the falls - not one I would use in a workshop). All of these questions need to be addressed prior to ever putting a camera to our eye. Too often we rush up to a scene, put the camera to our eye, and begin blasting away with no real conscious thought. We are simply in a reactive mode. This serves me well when photographing sports, but with landscape, even though the moments are fleeting (this mist could have evaporated within seconds) we need to be contemplative (have a plan) before we begin to react. So did I succeed in using my imagination to create a different look of these iconic falls? I'll let you the viewer be the judge. @Tamara: I would have loved to have gotten to the bottom of these falls Tamara, but the trail looked rather steep - not a place to lead a workshop group. Perhaps on m own time I will one day venture to the bottom. Hope your day is going well also! @Stefan: Kauai is such a beautiful island that it is hard to miss! I think I print out this post-checklist and keep near next week, when I will meet some great waterfalls :) This is good advice to encourage viewer's imagination also, propably it works well on waterfalls... Very nice mist here. @Vaido: One piece of advice that I left off this list is time of day for shooting waterfalls Vaido. Overcast works best so as not to blow out the highlights in the falls, but in the case of this image, early light 90 degrees off-axis to the falls allowed the light to skim. Dusk and dawn light would work well also. Good luck with your shoot! Love that mist. It makes the whole scene come alive. @JOEMULLIGAN: I had never seen that mist before - it was a treat! Thanks for sharing your thoughts Joe. this is an 11 Don, ! @elleven: I've never had an 11 before but I'll take it! Interesting moniker. What is the story behind it? Wonderful. This brings back lots of memories. We vacationed in Poipu for a number of years. @john4jack: It's amazing how built up Poipu is. I first visited the island in 1988 and most of the area was sugar cane. Then the infamous date of 9/11 came (1992 - Hurricane Iniki)! The Coco Palms Hotel is one of the last remaining structures that reveals the damage of the Category 4 Hurricane. So much to think about before pressing the shutter. @MJ Hubbard: It seems that way MJ, but like anything else, the more you do it, the more natural (and quicker) the process becomes. The one key thought I can offer is to answer the question: "What is most important about this scene." Once you have an answer, get to work visually trying to depict your answer. Well as you know I am not real strong in the technical yet (I also printed out your list). But I'm game to take a stab at your challenge (BTW, at best right now I do maybe 1/4 of the things you mention before panicking and firing away). To me, the dof looks really quite marvelous, especially when considering the mist which may have hindered that ability but, instead serves to assist. The perspective (pov) is awesome and works with the dof here, because at the edge (there's that word again) of the cliff where "da wadderfall" comes over, you can see that edge as it runs from the front left back INTO the picture and around curving to the left in the back and you can actually "feel" that - at least I do. Now since I have already taken up my 30 seconds I will just quickly add that the lighting and color is wonderfully accentuated at the top in the vegetation, especially...and the image is all balanced by the dark area on the bottom right. Ok I am out - thanks Don really cool piece here though -the falls look so much better in his piece. @Denny Jump Photo: Thanks for that reply Denny, I'll have to hire you to be the guest lecturer at our workshop image review sessions! Also, thanks for plugging my book on your blog. I just had a look at some of your posts and they are very well done. I love the sunstar over the lake! Hope you are having a great day. This looks great! Hard to capture mist or fog, in my opinion. I'm some what in the catagory of people that get to a spot, grab the camera, and start shooting. Though as of late I try to assess the scene, take my time to absorb what's going on, then set up the tripod. Thanks for the tips. @Steve: You are welcome Steve. I'll admit that there are times I am driving along and spot a special moment happening. I'll jump out of the car and get the camera to my eye ASAP! But most of the time, if we arrive at a location early, we won't have to rush. The mental checklist thing will become more intuitive the more you practice - it will just become part of your repertoire. Yes, Don, you certainly succeeded in using your imagination to create a different look of these iconic falls? Thanks again for the wonderful image, and your tutorial; I also saved your 'list'. @Judy aka Ladybug: Try thinking of the list as not a set of hard and fast rules; rather, think of it as a set of guidelines - a pre-flight checklist so to speak. The more a photographer is engaged and concentrating on the subject, the more successful the image will be. Tune out all the noise around you (unless it is something pleasant like a waterfall or birds chirping) and concentrate on first the technical, then get absorbed into the vision (creative) side. Turn that left side of your brain off and start to "feel" the image as you see it through your viewfinder. Imagine it as a finished piece. Stunning work!! Beautiful composition! Looks like something in a magazine! 5*****!! @Wild Mustang Photography: I appreciate your nice words Pam. I will be submitting this image to Getty, and if they select it, who know where it will run. I know I could be five times more successful in stock if I was to add the human element to my images, but I just can't seem to get myself to do that. Hope you are having a great day. This looks like one of those places that is so beautiful, that it take some time for the brain to process. @Ralph Jones: I feel that way about most of the island Ralph. Parts of Kauai are commercialized (Poipu and Princeville) but thankfully, most of this somewhat tiny island is still pristine. @DarkElf: I really feel there is a difference in how we approach a potential scene we are photographing. We can be proactive, where we engage with both the technical and creative sides, or simply reactive where we set the camera in auto mode and just start faming and clicking. I've never made successful images with the latter method so I don't use it. I would rather be the one in charge on both the craft side and the creative side, though I will admit, creativity is generally on an ebb and flow basis with me - somedays I seem more in tune than others. @MOHAMMAD: Thanks Mohammad - hope you are enjoying your day! Sir I assure you - I would lecture for free - actuallly I would owe you money after driving everyone out with my "blah, Blah, Blah" Give my love and admiration to Joan Baez if you see her at Big Sur!! @Denny Jump Photo: Maybe we'll have a Joan Baez meets Clint Eastwood moment - wouldn't that be weird!!! SO atmospheric, i love the sensation here - very rare, bravo for the light too. @k@: Thanks for stopping by my blog Katrine. I hope to hear from your again. This is so mysterious and has a timeless almost prehistoric feeling to me....I feel like this place has been here, and looked this way forever! The mist is incredible, and I think that's really what is giving me the timeless feeling- I love the list! Concrete things to really help get a photographer in the right frame of mind, figure out exactly what's important to us, and not miss something special by shooting in haste! @Tracy: Thanks as always for your in-depth thoughts Tracy - I really do appreciate you taking the time to write. I am also excited to see you exploring other genres of photography. Your interest in portraiture is similar to Mike Hall's and you both do excellent work. Keep it up! @Denny Jump Photo: That above-mentioned meeting would "Make my day!" Stunning shot. Love the mist and the flow of the waterfall. since you ask, i now tell you and soon you will understand. and they will always protect you if you are open.